Forbes rated squash as the number one healthiest sport to play in America. If you’re growing tired of your regular workout, and you’re looking for a new way to tone the muscles, lose pounds, and give your heart a great aerobic workout then, its time to try squash. Squash is phenomenal workout that’s easy learn and incredibly fun to play. Squash burns twice as many calories per hour than tennis does, it provides a balanced all round work out, and can picked up immediately. After one lesson our professional staff can have you playing a match. This strategic fast fun racquet sport is played in over one hundred countries around the globe. Players can burn off up to 1000 calories per hour of squash – much higher than most other sports. Basic principle of hitting the ball against the front wall until your opponent cannot return it. 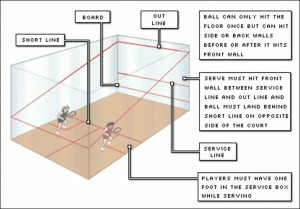 The ball must hit the front wall between the service line and the out line, and land in the area behind the short line on the opposite side of the court. For the remainder of the rally, players must hit the wall above the board (tin) and below the out line. Ball may only hit the floor once before each shot, but it can hit as many walls as the player wants. Try it yourself or with a friend soon–you’ll discover a great new work out and a sport for life! Our professional staff can offer you private lessons or group clinics to get you started. Book a squash lesson to get started!